WOLVERHAMPTON put in a battling performance to get back to winning ways with a 49-41 victory over King’s Lynn at Monmore Green. A fine showing from Swedish star Freddie Lindgren led them to a much-needed win as they put last week’s disappointing defeat against Swindon right behind them. Lindgren stormed to four wins out of five on his return to the No.1 race jacket, only being denied a maximum in a close battle with Niels-Kristian Iversen in the final race. It was a fine showing from Lindgren as he continues his recent upturn in form, although he received plenty of support in what was a solid all-around team display as Peter Adams’ side moved six points clear of the bottom of the Elite League table. Ricky Wells notched eight points with a composed display whilst skipper Peter Karlsson added paid nine including a vital 5-1 alongside Lindgren in heat 13 to wrap up victory. Tobiasz Musielak and Jacob Thorssell both added race wins, with Thorssell combining with Lewis Blackbird for an important heat nine maximum to spark an excellent late surge after a tense first half of the meeting. Blackbird and guesting No.7 Max Clegg put in solid showings in the lower order to complete a strong team effort and ensure Wolves prevented the Stars from earning a consolation point. And team boss Peter Adams was pleased to see his side emerge with a well-earned victory. He said: “It was a typical Wolves performance I thought, with Freddie leading from the front and solid performances in all other departments. 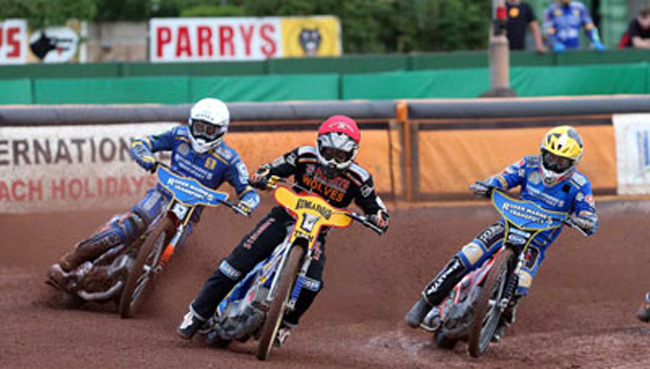 Wolves will be back in action on Wednesday (8pm) as they travel to Belle Vue aiming to end their troublesome away form. WOLVERHAMPTON 49: Freddie Lindgren 14, Ricky Wells 8, Jacob Thorssell 7, Peter Karlsson 5+4, Lewis Blackbird 5+2, Max Clegg 5+2, Tobiasz Musielak 5. KING’S LYNN 41: Niels-Kristian Iversen 13, Kenneth Bjerre 10+1, Nicklas Porsing 8, Ashley Morris 4+1, Rob Branford 3+1, Vaclav Milik 3, Robert Lambert R/R.